Mention long range muzzle loading to most shooters today and the classic .451 match rifle most likely comes to mind. 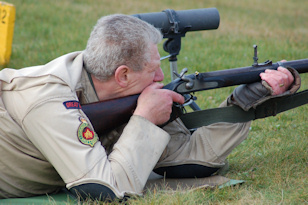 For many years however the Muzzle Loaders Association of Great Britain (MLAGB) have included within the calendar of events National Rifle Championship matches at 200, 300, 500 and 600 yards for Enfield rifles, the service arm of the British soldier in the mid-19th Century. 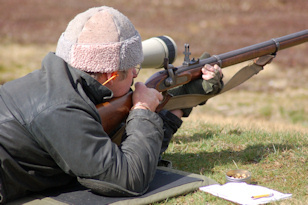 The Long Range Rifles Branch includes within their competitions the Asquith Cup match, an aggregate fired at 600 and 800 yards with .577 military percussion rifles. For those accustomed to the management of the match rifle with all its finesse, the simplicity of the military muzzle loader will come as a joy. The careful cleaning between shots, the wads and paper patched bullets, and the studious attention to vernier adjustable sights can all be set aside. Anyone who shoots military rifles at 100m has all the essentials necessary for a foray out to longer ranges. Powder, lubricated Minie bullets and percussion caps are all that’s needed. All shooting is from the prone position with a two point military sling the only permitted support. The rifle most commonly seen on the ranges is the ‘two band’ Enfield. The Parker-Hale Pattern 1858 Naval Rifle is popular, as are original versions of this Pattern or similar short rifles. The common feature is the heavy 33 inch barrel with 1 in 48 inch twist rifling. The Pattern 1853 Rifle Musket is however seen on the ranges and can perform well. One attribute perhaps accounting for the popularity of the shorter rifle is the sights; the rearsight is placed four inches further away from the eye and this can enable the shooter to gain a clearer picture of the sights. Original two and three band Enfields on the firing point. is positioned further away from the shooter. Grease grooved Minie bullets are in general use. Essentially there is no significant difference in loading between short range and long range. An increase in powder charge is often made though and to compensate for this some have modified base plugs on their bullet moulds to cast a thicker skirt on the bullet. Where the discipline really comes into its own is the ability to aim off to allow for wind. Sights are crude when compared to the match rifle, with just a simple slide for elevation and no windage adjustment. With the rainbow like trajectory of the 540-560 grain bullet, close attention to changing conditions is essential. Slight changes in head or tail winds and the bullet will drop short of or sail over the target. Point of aim may be several feet to the side of the target if the wind is strong; if one is lucky a clump of grass or other such feature in the butts may provide a point of reference. This brief introduction has hopefully brought to the attention of shooters the greater possibilities of the military muzzle loader. Long range shooting with theses rifles is a challenging discipline, frustrating at times yes, but also immensely satisfying. Beware it is also addictive! Give it a try. Long Range Muzzle Loader - Reference/Resource site for long range target shooting with the muzzle loading rifle.